Great Phoenix just to honour you." Whom I like and Why: I like the Phoenix because it always sings a poem or a verse about itself. This Phoenix can talk and it has magical powers. It tells the four children about the magical carpet which can take you to different places. Whom I dislike and Why: I don't dislike anybody in the story as everybody play a good part in it. 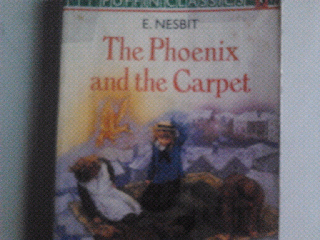 Setting/Theme of the story: Anthea, Robert, Jane and Cyril find out that a Phoenix has hatched in their house. They also find out that the Phoenix can talk. It is much more surprising for the children when the Phoenix reveals that there is a magical carpet in their house and accompanies them in a series adventure they have with the carpet which can take anyone anywhere they want three times a day. Part I enjoyed the most: I like the part where the children become invisible but see their baby brother and their mother using the help of the magical carpet. Different Ending: The Phoenix burns itself and starts sleeping inside its new egg. The capet is being sold by the chidren's mother in the market as she feels that her children get stupid dreams. All are back to normal once again.